The below article, written in mid-August, appeared in the October 2016 print edition of Maximum Rocknroll. For the latest on the teachers’ strike in Mexico, see my most recent Insumisión column. In the fall of 2008 while in the city of Oaxaca, I walked with David Venegas in the plaza in front of the Santo Domingo Cathedral, a massive four-block church and former monastery whose construction first began in 1572. We were returning from the courthouse nearby, where Venegas had to report every 15 days. A prominent member of the Popular Assembly of the Peoples of Oaxaca (APPO) and the anti-authoritarian group Oaxacan Voices Building Autonomy and Freedom (VOCAL), Venegas was arrested, beaten and tortured in April 2007, held for eleven months on charges of “possession with intent to distribute cocaine and heroin, sedition, conspiracy, arson, attacks on transit routes, rebellion, crimes against civil servants, dangerous attacks, and resisting arrest,” and eventually conditionally released. Until he was found innocent in April 2009, one of those conditions was his semi-monthly presentation at the courthouse. As with any trip he made in public, Venegas had at least one person accompany him to provide some security against being arrested or disappeared. During this walk he recounted a story from July 2006, about a month after the people of the southern Mexican state of Oaxaca rose up in open rebellion against the state government. From the plaza in Santo Domingo, which served as the center of the social movement in 2006 after it was forcibly removed from the city center – the Zócalo – one can see an auditorium on a nearby hill called Cerro del Fortín. This auditorium was built by the state government specifically for the annual celebration of the Guelaguetza. Guelaguetza is both an event and a concept. It is an indigenous Zapotec word meaning reciprocity or mutual aid, an important tenet of communal indigenous life. It is also a state-run occasion which brings dancers from Oaxaca’s seven regions to perform “traditional” dances, modified from indigenous festivals which marked the beginning of the planting season. The state’s biggest tourism draw, tickets to the annual July Guelaguetza cost around 400 pesos (at the time around $40 US dollars), beyond the means of the average Oaxacan, thereby excluding them from a celebration of their own culture. Just before the state-run Guelaguetza was to be held in July 2006, Venegas told me, “During those days of freedom, I was walking here in front of Santo Domingo and saw people up in the auditorium painting ‘FUERA ULISES’ in huge letters on the seats.” (“Ulises Out,” referring to then-governor Ulises Ruiz Ortiz.) Opposition was so great that the state ended up canceling the commercial Guelaguetza, while the APPO organized its own, free People’s Guelaguetza. The above anecdote of an anecdote serves as a microcosm for a story still unfolding. A story told standing in the shadow of a building which serves as a reminder of the 500 year legacy of colonialism, by a survivor of state repression, about a social movement not only fighting against a despotic regime, but at the same time working to reclaim and reimagine life and culture outside of the structures of an authoritarian state and an impoverishing neoliberal system. While the 2006 Oaxaca Commune was crushed by federal police and military force five months after running the state government and police out of power and administering affairs via popular assemblies, the embers which led to that rebellion remained smoldering. Fast forward a decade later, and the resistance in Oaxaca has just finished celebrating its Tenth Annual Teachers-Peoples Guelaguetza. For good measure, they also set up blockades around the Cerro del Fortín at 6am the morning of the second of two commercial Guelaguetza performances, causing the festivities to occur in front of a largely empty auditorium. Just as in 2006, what started this year’s revolt was a teachers’ strike. Teachers belonging to the National Coordinator of Education Workers (CNTE), a more radical faction of about 200,000 inside of the 1.3 million-strong National Union of Education Workers (SNTE), the largest union in Latin America, have been on indefinite strike since May 15. Their primary demand is the repeal of the “Educational Reform” initiated by Mexican President Enrique Peña Nieto in 2013. A neoliberal plan based on a 2010 agreement between Mexico and the Organization for Economic Cooperation and Development, the reform seeks to standardize and privatize Mexico’s public education system, as well as weaken the power of the teachers’ union. Publicly supported in his efforts by pro-business lobbying groups such as Mexicanos Primero and the Employers Confederation of the Mexican Republic (COPARMEX), Peña Nieto set out to implement the OECD agreement and then some, changing Articles 3 and 73 of Mexico’s Constitution. Together, they create a standardized system of teacher evaluation, as well as granting schools “autonomy” — that is, autonomy to raise funds from the private sector — in other words, to become privatized. The teachers are also demanding more investment in education, freedom for all political prisoners and prisoners of conscience, truth and justice for the 43 disappeared students from Ayotzinapa, and an end to neoliberal structural reforms in general. While the CNTE has been fighting against the educational reform for the past three years, a teachers’ strike in and of itself is fairly uneventful. It occurs annually in Oaxaca as a tactic used by the union leading up to the beginning of the school year in the fall. Usually the strike happens, followed quickly by negotiations with the state. A compromise is reached and everyone goes home. This year, however, the CNTE upped the pressure by announcing a national strike instead of on a state-by-state basis. And this year, like in 2006, the state refused to even talk to the union, instead deploying thousands of federal police and gendarmerie to areas where the strike is strongest — primarily Oaxaca, Chiapas, Michoacán and Mexico City, though also in states such as Guerrero, Tabasco and Veracruz. In another echo of 2006, it was a brutal act of state repression that turned a labor dispute into a widespread revolt. Ten years ago, it was the pre-dawn raid and destruction of the teachers’ encampment in the Zócalo of Oaxaca on June 14. 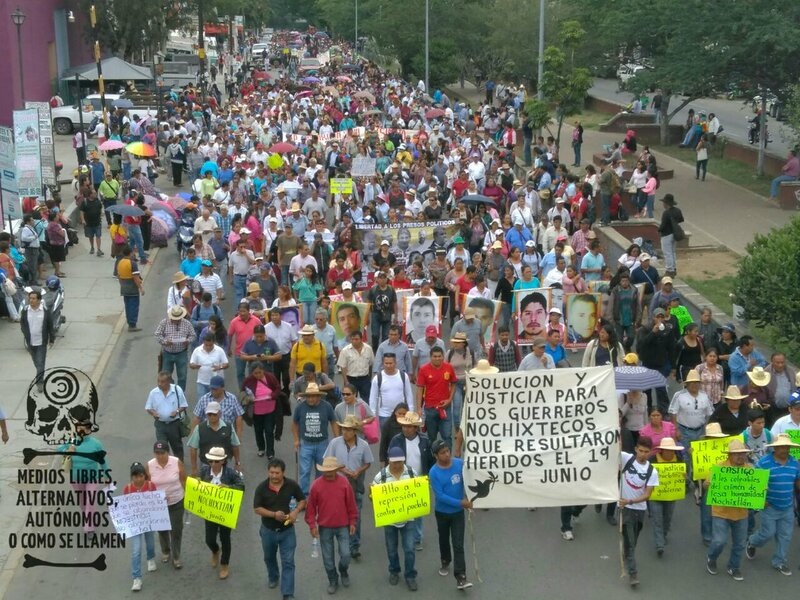 Following the beginning of the strike this year, there were several police actions against teachers in Oaxaca, Mexico City and Chiapas; as well as the arrest of the Oaxaca union’s leadership. In response to police attacks, teachers in Oaxaca began setting up barricades and highway blockades around the state. By mid-June of this year, the CNTE controlled 37 critical spots on highways throughout the state, blockaded in part with 50 expropriated tanker trucks. The blockades were so effective that ADO, a major first-class bus line, indefinitely cancelled all trips from Mexico City to Oaxaca and federal police began flying reinforcements into airports in the city of Oaxaca, Huatulco (on the coast), and Ciudad Ixtepec (on the Isthmus). They have beaten them, gassed them, imprisoned them, threatened them, fired them unjustly, slandered them, and declared a de facto state-of-siege in Mexico City. What’s next? Will they disappear them? Will they murder them? Seriously? The ‘education’ reform will be born upon the blood and cadavers of the teachers? On Sunday, June 19, the state answered these questions with an emphatic “Yes”. The response came in the form of machine-gun fire from Federal Police directed at teachers and residents defending a highway blockade in Nochixtlán that for a week had been successful in preventing hundreds of federal forces from reaching the city of Oaxaca. Initially, the Oaxaca Ministry of Public Security claimed that the Federal Police were unarmed and “not even carrying batons”. After ample visual evidence and a mounting body count to the contrary, the state admitted federal police opened fire on the blockade. In total, eleven were killed that morning in Nochixtlán. At the time of this writing, a total of fourteen have been murdered by the state in Oaxaca during the course of the conflict, including Salvador Olmos García, aka Chava, a community radio journalist and pioneer of the anarchopunk movement in Huajuapan, who was kidnapped, beaten, run over and left for dead by police on the streets of that city on June 26. Following the Nochixtlán massacre the struggle has taken on an increasingly popular dimension. This has looked like direct actions, marches, material support and expressions of solidarity from across Mexico and beyond, in numbers far too large to recount individually. By way of example, here are some of the actions that have occurred since. Parents and teachers took over toll booths in both Mexico City and Durango for a day, allowing cars to pass through for free. On July 3, an explosives device was detonated at the headquarters of business associations in Mexico City who have been lobbying the government to crush the uprising. There were three days of intense mobilizations from July 5-7 in Mexico City. On the first day, there were at least 70 simultaneous blockades and marches, followed by four mass marches on July 6, and at least ten blockades on July 7. The Zapatistas have continued releasing statements in support of the teachers’ struggle, stating, “To say it more clearly: for us Zapatistas, the most important thing on this calendar and in the very limited geography from which we resist and struggle, is the struggle of the democratic teachers’ union.” They also went further and announced that they were suspending their participation in the July 17-23 CompArte Festival for Humanity, which they had called for earlier this year. Instead, they sent delegations from all the Zapatista caracoles to donate the food they would have eaten during the seven day festival to the teachers in resistance in Chiapas. This amounted to 290,000 pesos (15,600 USD) worth of food. In recognition of the contribution of the people to their struggle and the fact that the people have demands which extend beyond the immediate concerns of the union, on July 9, Section 22 of the CNTE in Oaxaca called for a gathering of teachers and indigenous leaders to “build a peoples’ agenda against structural reforms.” The union met with authorities from 90 municipalities in the state. Important to note is that these authorities are selected as the moral leadership of their communities not through a vote based on political party, but through nominations, discussions and agreements reached in community assemblies. A second such gathering was held in early August. At the same time that all these actions have been occurring, the CNTE and the Interior Ministry have been holding negotiations – negotiations which the state agreed to following the massacre. They have met a total of seven times, addressing political, educational and social issues. At each meeting the teachers come prepared with specific proposals and ask the government to do the same. After each meeting the end result has been the same: no progress on the core issues. Scott Campbell is a radical writer and translator based in Oakland, California. He previously lived in Mexico for several years, including Oaxaca. His pieces appear frequently on El Enemigo Común and It’s Going Down. He can be found online at fallingintoincandescence.com and @incandesceinto on Twitter. This entry was posted in Mexico and tagged Capitalism, cnte, mexico, neoliberalism, nochixtlan, oaxaca, state, teachers, teachers strike. Bookmark the permalink.